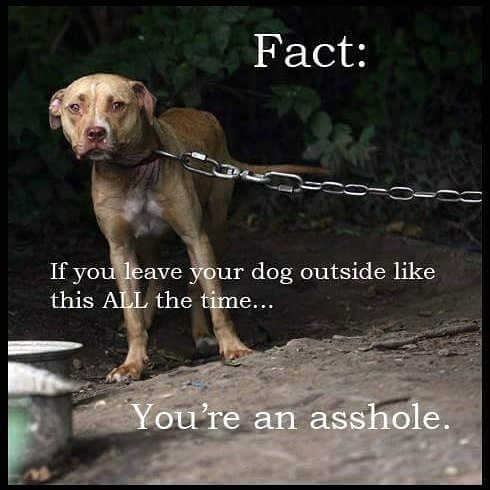 To those idiots who think dogs are "toys"
Please never tie your dog outside your place and abandon it for whole day. Usually, people love and cuddle the puppies and leave them in couple of months as they begin to grow and become responsibility. Puppies are not "living toys" they look cute because they're cheerful and playful. But people should understand that unlike human babies, the dogs never grow to be a self dependent living being. They will always be a baby, if you don't train them, they will poop inside, chew off your sandals, tear off your clothes, sofas, beds, everything and anything. Dogs are sensitive animals like horses. They are more prone to depression and they are well aware of human emotions. If you abandon them like this they will become dangerous and bite others. Just giving them left overs and keeping them outside your homes "for protection" isn't the right thing, you're not only torturing the animal but also displaying the world that "how big jerk you're". Treat your dogs like the member of your family, not like a stuffed toy for your own babies or a gatekeeper of your threshold. The simplest thing we can do, don't pet a dog just because you see a cute cuddly puppy playing with your feet, when you cannot take care of it like your own child. informative post! I really like and appreciate your work, thank you for sharing such a useful facts and information about human resource information technology strategies, keep updating the blog, hear i prefer some more information about jobs for your career hr jobs in hyderabad .